Bosch Packaging Technology is set to unveil new scalable cookie and cracker packaging systems at interpack 2017. At the event, the company will present scalable packaging systems for sweet and savoury biscuits for slug and pile pack applications. The smart pile loader (SPL) system provides manufacturers with increased product protection and ability to adjust the level of automation to match current and future needs. The system features an advanced vibratory infeed, as well as horizontal flow wrapper and new integrated topload cartoner. Bosch has developed the SPL system for gentle product handling from feeding through to collation, enabling to improve product protection, full product control and continuous product flow. Bosch’s new technology will also allow to easily adjust stacking mechanism to the varying product thickness without machine stoppage to accommodate inconsistencies in product heights that result from the baking process. 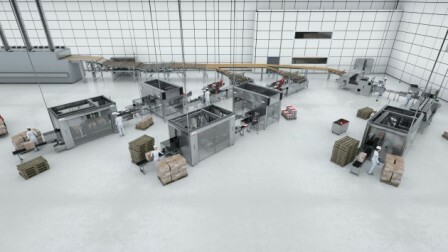 The firm’s new integrated topload cartoner (Kliklok ITC) is said to aggregate three functions, including carton erecting, loading and closing, while the smart measuring loader will portion the biscuits and place them into trays. Later, the smart slug feeder will place the trays into the infeed of the horizontal wrapper Pack 301 LS. The firm will exhibit Kliklok SFR endload cartoner with TRAC-i infeed and the new Elematic 1001 SL case packer for secondary packaging applications, while universal sideload case packer Elematic 1001 SL for small and medium-sized manufacturers. Bosch Packaging Technology horizontal packaging systems product manager Andreas Schildknecht said: “The industry shows an increased demand for flow wrapped cookies and crackers, both on edge and on pile. Image: Bosch to exhibit calable cookie and cracker packaging systems at interpack 2017. Photo: courtesy of Robert Bosch GmbH.